DUKE RECORDS - was an American record label, started in Memphis, Tennessee, in 1952 by David James Mattis (WDIA program director and disc jockey) and Bill Fitzgerald, owners of Tri-State Recording Company. Their first release was Rosco Gordon singing "Hey Fat Girl", issued on Duke R-1, later amended to R-101. After forming a partnership with Mattis in the summer of 1952, Don Robey (founder of Houston's Peacock Records) took control of Duke. Both labels then headquartered at his Bronze Peacock club at 2809 Erastus Street in Houston, focusing on rhythm and blues and gospel music. Robey started in 1957 a subsidiary, Back Beat Records, in 1957 and in the 1960s, Back Beat became a soul music label with album issues by Joe Hinton, O.V. Wright, and Carl Carlton. Duke Records in the 1960s had hits by Bobby "Blue" Bland and Junior Parker. Don Robey sold Duke/Peacock to ABC-Dunhill on May 23, 1973, but stayed on, as a consultant with ABC overseeing the release of catalog material. Don Robey died on June 16, 1975. 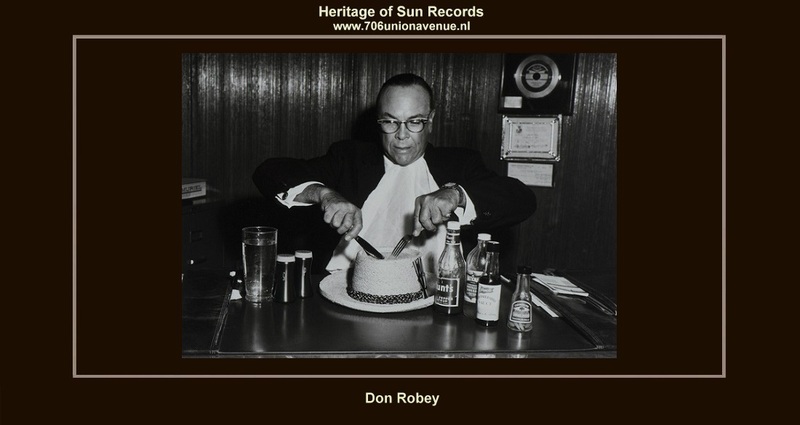 DON ROBEY - Label owner, songwriter, producer, his name should be on any serious list of early pop, rhythm and blues pioneers. His Duke-Peacock family of labels boasted an impressive roster: Johnny Ace, Bobby "Blue" Bland, Big Mama Thornton, Clarence "Gatemouth" Brown, the Dixie Hummingbirds, O.V. Wright, Carl Carlton, the Five Blind Boys of Mississippi, Inez Andrews, Memphis Slim, Little Junior Parker, Joe Hinton, and more. Born on November 1, 1903, in Houston, Texas, Robey's entrepreneurial spirit was nutured while growing up around the elite of Houston's black business community. Dropping out of high school, he tried his hand at being a professional gambler. After marriage and having a son, he opened a taxicab business. Combining his passion for music with his business sense, Robey became an event promoter, holding ballroom dances around the Houston area. During the late 1930s, Robey left Houston for a few years for Los Angeles, opening the Harlem Grill night club. After returning to Houston in the mid-1940s, he opened the Bronze Peacock Dinner Club spotlighting top jazz talent. Later, Robey opened a record store and in 1947 he became a talent manager signing blues singer/guitarist Clarence "Gatemouth" Brown. In 1949, after a bad experience with Palladium Records, Robey decided to start a record label and asked Evelyn Johnson to do some research. Based on her work, Robey decided to start Peacock Records and recorded Brown as his first artist. The double-sided hit "Mary Is Fine" (number eight rhythm and blues) backed with "My Time Is Expensive" (number nine rhythm and blues) was a hit during late 1949. More hits followed: Marie Adams' number three rhythm and blues hit "I'm Gonna Play The Honky Tonks'', Floyd Dixon's number eight rhythm and blues hit "Sad Journey Blues'', and Willie Mae "Big Mama" Thornton's number one hit "Hound Dog''. In 1952, Robey merged his Peacock label with Dave James Mattis' Duke Records of Memphis, Tennessee, and Duke-Peacock was born. Robey took over full ownership of the label in 1953. Signed to Duke were legendary blues singer Johnny Ace and Roscoe Gordon. Ace had three number one rhythm and blues hits: "My Song'', which held the top spot for nine weeks during the fall of 1952; "The Clock'', which was number one for five weeks in summer 1953; and "Pledging My Love'', which was number one for ten weeks. The rest of Ace's singles were Top Ten rhythm and blues hits: "Cross My Heart" (number three), "Saving My Love For You" (number two), "Please Forgive Me" (number six), "Never Let Me Go" (number nine), and "Anymore" (number seven). The singer's legend only increased when he was fatally shot during a backstage game of Russian Roulette at Houston's City Auditorium, dying the following day on December 25, 1954. Another early Duke-Peacock star was Little Junior Parker. A cousin of Al Green and a bandmate of Howlin' Wolf, the singer/harmonica player first hit the charts with "FeelinFeelin' Good" by Little Junior's Blue Flames on Sun Records, which hit number five rhythm and blues in fall 1953. His first Duke hit was "Next Time You See Me" (number seven rhythm and blues) in 1957, and more Top Ten hits followed: "Driving Wheel," "In The Dark," and "Annie Get Your Yo Yo''. Charting 45 singles on the rhythm and blues charts and 33 on the pop charts, Duke-Peacock's all-around biggest rhythm and blues star was Bobby "Blue" Bland. A bandmate of Johnny Ace, Rosco Gordon, and Little Parker in the Beale Streeters and a Duke artist before the merger, Bland first charted with "Farther Up the Road'', a number one rhythm and blues hit in fall 1957. Bland's batch of Duke-Peacock Top Ten rhythm and blues hits also includes "Little Boy Blue'', "I'll Take Care Of You", written by Brook Benton, "Lead Me On'', "Cry Cry Cry'', "I Pity The Fool'', "Don't Cry No More'', "Turn on Your Love Light'', "Ain't That Loving You'', "Yield Not To Temptation'', "Stormy Monday Blues'', the double-sided hit "That's the Way Love Is" b/w "Call on Me'', and "These Hands (Small but Mighty)''. No record label can have hits without talented personnel in the background. Robey's staff included promotion/sales reps Dave Clark and Irving Marcus, as well as producer/arrangers Joe Scott, Johnny Otis, and Bill Harvey. Evelyn Johnson ran Robey's Buffalo Booking Agency. The club and the label were located at 2612 Erastus Street. Robey began issuing gospel on Peacock; in fact, he issued more gospel music than blues or rhythm and blues. He assembled an amazingly rich and enduring roster of gospel talent: the Dixie Hummingbirds, the Sensational Nightingales, the Mighty Clouds of Joy, the Five Blind Boys of Mississippi, Reverent Cleophus Robinson, Christland Singers (with original Soul Stirrers lead singer R.H. Harris), O'Neal Twins, the Highway QCs, Reverent W. Leo Daniels, Reverent Julius Cheeks, Swan Silvertones, Harmonizing Four, Willie Banks and the Messengers, Mildred Clark, Tessie Hill, Charles Fold and the Gospel Messengers, Sunset Travelers, and others. The Hummingbirds, who were still performing in the 1990s, made the rhythm and blues charts with "Loves Me Like A Rock" (number 72 rhythm and blues in fall 1973). That same year, the group backed Paul Simon on his gold number two pop remake of the tune in late summer 1973. Robey also released gospel on his Song Bird label, which was formed in late 1963. In 1957, Don Robey started Back Beat, an R&B label that had hits with O.V. Wright, Joe Hinton, and Texas rock-country singer/guitarist Roy Head and the Traits. Also signed to Back Beat was rock group the Rob Roys, which included future hit composer/producer Charles Fox ("Happy Days"). Carl Carlton, whose two biggest hits were the 1981 million-seller "She's A Bad Mama Jama" and "Everlasting Love'', got his first big break through Don Robey. Carlton, who started recording for Lando Records in his teens as Little Carl Carlton in 1964 in his native Detroit, was signed to Back Beat after the label picked up the Lando single "Competition Ain't Nothin'''. While industry vets like Gus Redmond and Rick Roberts can talk of Robey's notorious ways, an important fact should not be overlooked: Robey was one of the first African-Americans to own a highly successful record label in the United States, predating Motown's Berry Gordy by more than a decade. The music business can be extremely rough and Robey proved that he could be as rough as any of his peers. Robey sold Duke-Peacock to ABC-Dunhill Records on May 23, 1973. He was retained as a consultant with ABC, which reissued the Duke-Peacock catalog. During the 1980s, MCA Records purchased the ABC Records catalog, including Robey's legacy. On June 16, 1975, Don Robey died in his native Houston.